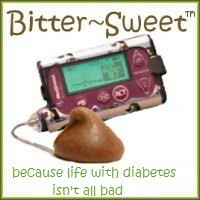 Bitter~Sweet ™: What diabetes supplies to you lug around? A while ago Lee Ann from The Butter Compartment did a vlog in which she went through her purse to show all of the medical supplies, and medical waste, that she lugs around. Yesterday Kerri at Six Until Me did a similar vlog. So I decided I'd put the contents of my purse on display for everyone too! The video quality of my laptop web-cam is pretty poor. The words often don't match up to my lips. There is also a flash of light near the beginning which seemed to make everything blurry for a while. I move too fast and use my hands too much when I speak. I can't help it, I am half Italian. All of that fast movement doesn't help with the blurry issue. (I did debate trying to shoot this again on my digital camera, but I couldn't deal with making another big mess.) I apologize in advance to anyone who gets motion sickness while watching my vlog. I need to learn how to put the fancy lettering on the vlogs so I can show people's web addresses when I talk about them. When I'm nervous, I tend to over-state the obvious. And babble. And incorrectly identify things. I need to learn to hold things up higher if I expect the camera to see them. I carry enough candy in my bag to treat lows for the whole D-OC. I can't tell a dime from a nickel. Travel cups will crack me up. I'm forgetful in front of the camera. I meant to shake my empty bag and see how many old test strips would fall out. It didn't happen. Maybe that's a project for a future vlog! Too scared to watch it? No? Okay, don't say I didn't warn you!! Karen, I had no idea! Thank you for sharing what you have to carry. I agree that one can never have overly moisturized lips or enough Smarties. Love Smarties! And I compartmentalize my bag by what's important and where it goes--zippered items are always VIP. Thanks for sharing! Holy crap that's a lot of candy! I feel like if I ever do have dinner with you, it's just going to consist of a giant bowl of Smarties. But maybe with the extra space on the dinner table, we can play that football/hockey/whatever it is game with the 3 nickels. That's amazing! I too had no idea what one needs to carry. We have the same meter!!! God, we really do deserve extra carry-on while flying! I'm not sure if it was you cracking up about travel cup or the travel cup in general but I was cracking up at that part!! hahah just laughed thinking about it! you totally look like the matrix or something...love the video! my purse, car, bedroom, bathroom, kitchen *shh! * are covered in used test strips. ick! The matrix thing was super gnarly! All you needed was some sweet action music! Wowo, now I feel so much better about all the stuff I carry. I have downsized a bit lately but it is still stuffed to the gills! 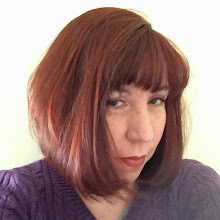 You have an excellent blog, Lora! We'd like to share it with our readers. I just emailed you and hope to talk soon. Sorry to get your name wrong, Karen! Apologies! Inspired by you and Kerri and Leanne, I have done my own "diabetic handbag" vlog. I'd love to know what you think! Nice blog! There are very few blogs like you, which are so useful and very informative. I like your text. I have a blog on my medical supplies business and came across your blog while researching over Internet.